HVC HAS NO UNIFORMS so bring casual clothes that are good for an active, creative time at camp. LAYERS help, as the early mornings and nighttime may be cool. HELPFUL ITEMS include a daypack to carry your bathing suit, towel, riding boots, etc. ; stationery, stamps and pre-addressed envelopes; a water bottle; sunscreen; and a “crazy creek” chair. We give everyone an HVC T-shirt. You can find fun HVC “stuff” at Planet Meg, the greatest camp store in the galaxy. PLEASE DO BRING if you want to: Books (no kindles) musical instruments, costumes, games to play at rest period. A full packing list can be found here. You’re going to be having a blast this summer! Worried that your folks won’t know what to do without you? Tell them to read our News Reports from HVC every day this summer. Our correspondents will upload information about your cabin activities, menus, weather. We might even give the people at home a hint about when the Candy Drop is happening. 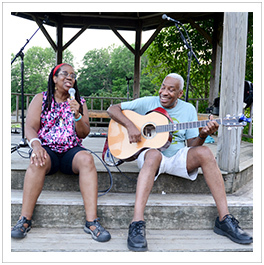 Consummate musicians and storytellers Kim and Reggie Harris! The amazing illusions of Peter Boie! Here's a partial list for 2019... Aisling, Haley, Natalie, Julia, Paulina, Anna G, James, Ellie, Eliana, Kaytee L. (2017), Charlotte, Sam O., Kyle, Lia, Megs, Allwynne, Michelle, Hope, Georgia, Aileen, Ilana, Danica, Sophie, Callan, Elise, Cassie R., Dani, David R., Phillie, Hannah, Carmi, Tom, Philippe, Gabe, Amanda, Moses, Kristy, Carla, Kirsten, Melissa, Jake, Jess D., Karen, Margo, and Joanne. More names to follow... Awesome summer on the way! Select a book at our book fair! The Program Directors (PD’s) are a group of longtime HVC staff who work closely with Peter and Meg in developing all camp programs. Learn more about this summer’s group here.